Hello SRM fans! 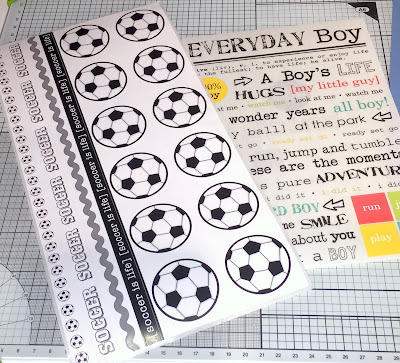 Emma here today to share a quick and easy soccer-themed scrapbook page with you. You may have read in my bio that I am originally from England, having moved here to Ontario, Canada over 10 years ago. Soccer (or football as we prefer to call it) is a huge part of a lot of British people’s lives, as the most popular sport. It’s fair to say I am a big fan, and have followed my London-based team, West Ham United, for over 35 years. They aren’t the most successful team (to put it mildly), but I can’t imagine supporting anyone else. Luckily the TV channels here show a lot of the games, so I don’t miss out as often as I did when we first emigrated. Canada is very focused on ice hockey, but they do also have a lot of kids’ soccer programs which is ideal for our family. My son has played for the past 2 years, and really loves it. 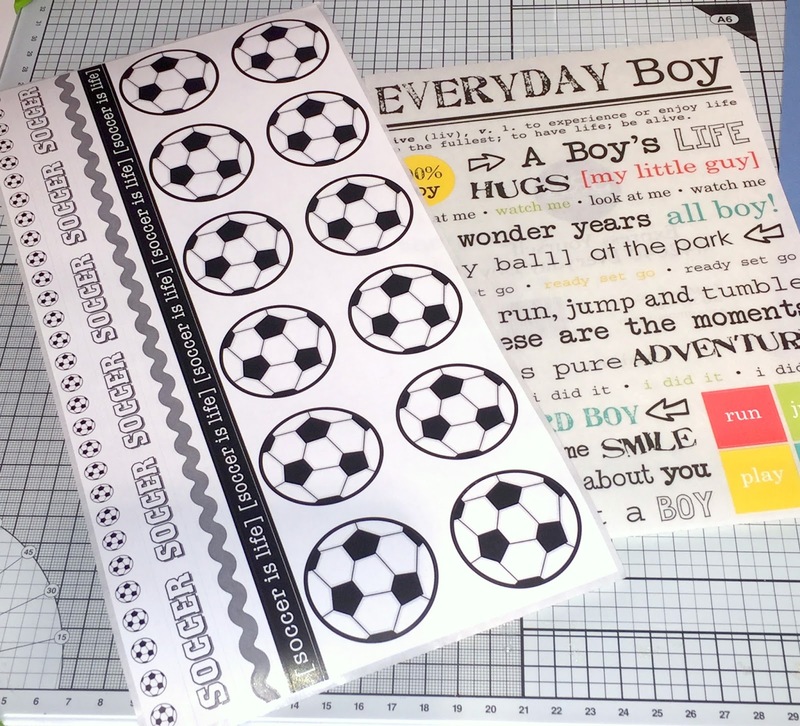 SRM has some terrific soccer-themed items, so for this project I chose the Stickers By the Dozen pack, and the Express Yourself Everyday Boy set to make my scrapbook page of this year’s soccer pictures. I used a plain blue cardstock background, and some patterned paper from Fancy Pants Designs to complete the page. The date was stamped using the SRM Today, Tomorrow, To Do clear stamp set. This was such a quick project to make, all thanks to SRM’s products! Scrapbooking in a jiffy, as we would say in England. 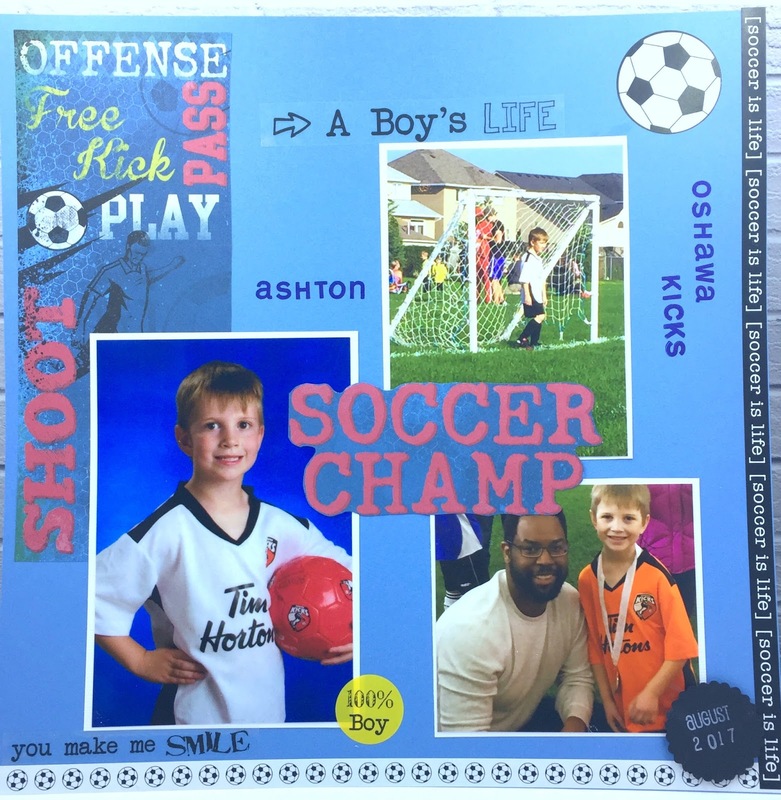 As a Mom, I am hoping for the day I can scrap pictures of my son playing for my beloved West Ham, or indeed for England. He could even choose to play for Canada if he wanted to, thanks to our dual citizenship!